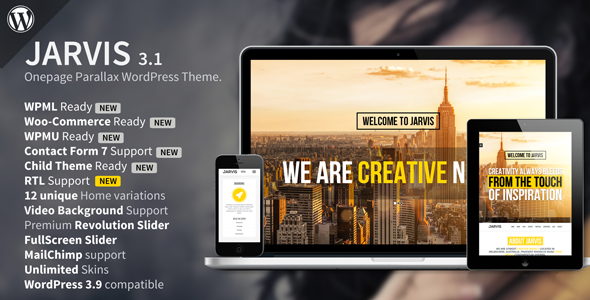 Jarvis 3.1 newest version : Released on June 16th, 2014. * Youtube and Vimeo loading issues in IE11 fixed. * FlexSlider Navigation disappearing on IE11 fixed. * Team Popup profile loading issue in Firefox fixed. * Parallax images pixelating on retina devices fixed. * Youtube Video Error fixed. * RTL Minor bugs fixed. * Range error fixed that crashes site for few users. * Menu smooth scroll spacing issue solved. * Initial flickering of default accent color fixed. * Flexslider for RTL version fixed. * Flexslider images max width set to 100% to avoid pixelating of images.